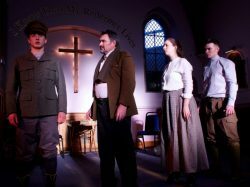 EAST Dorset-based State of Play Arts gives two performances of The Gathering – Messages from the Great War with Artsreach, the second on Friday 16th November at Briantspuddle. This powerful new play, by writers Gill and Tony Horitz, is based on letters and other found artefacts telling the story of two Dorset soldiers who fought in the First World War– Will Cutler of Hinton Martel and Hubert Wareham of Wimborne Minster, and two people closely involved in their lives – Will’s wife, Tillie, and the Vicar of Wimborne Minster, the Rev James Fletcher. Intensely moving, The Gathering is both a love story and a message of resilience and hope. The performances will be preceded by a screening of Tommy’s Sisters, a short film about five women in 1916.